Ah finally time for the Mothman post. Though I will warn everyone that it will be a rather brief post. Why is this? Well there isn’t really an entire lot to be said about this insanely elusive cryptid. Outside of its appearances and its possible connections there isn’t much to write about. If anyone wants to read reports on it just go to Google and do some skimming. With that out of the way lets get started. Mothman, as I learned about him from the Weird travels program long long ago in a galaxy far far away, is a cryptid with a penchant for being a harbinger of doom. The last bit is due to a disastrous event involving a bridge in Point Pleasant West Virginia, for there were many sightings of the creature leading up to the collapse. Many for that reason believed it was just the messenger, while some prefer to believe that it was the cause of it. Either way both theories on that are neither here nor there. After all a cat waved it’s paw and now everyone can find Maneneko statues everywhere in Japan just about. Though if either one was true I’d certainly hope that it was the former that held true. If one were to visit Point Pleasant they might find some people to be tight lipped about it. I recall one woman that was interviewed stating she was afraid to talk about it that “it might bring it back”. At the time I thought that sentiment to be absolutely ridiculous. The cryptid isn’t the creature from the “Don’t think about it” goosebumps Halloween special. Going for a moment onto the creatures appearance according to reports it was as large or larger than a man, large glowing eyes, and an expansive wing span. Certainly not the thing, but it would haunt ones nightmares for a while I could imagine. With that processed it’s no wonder many of the locals were afraid of it even long after it supposedly vanished. “Supposedly? What do you mean by that?”. What I mean is there have been other sightings of it outside of Point pleasant. Of course it has possibly been referred to under separate names. The main one I know of is that of Owlman. It’s “sister” cryptid was spotted in Mawnan Cornwall. 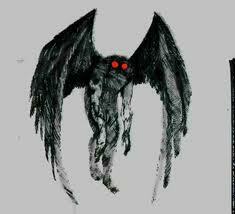 Like the Mothman it was seen and/or heard for a period of time and supposed encounters going on past the original reports. Main reason I say supposed is because at this point a majority of encounters could either be hoaxes or misidentification. 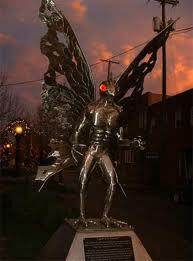 There’s even a festival for Mothman now so to have more encounters would spur it on and people with a thing for pranks. I’m not trying to bash any credibility on anyone here but if the initial encounters were real I believe Mothman has long since moved on and that Point Pleasant has gone taken the same approach a South Carolina town did Lizard man. To add to it’s lack of credibility at this time is that apparently people have terrible depth perception at night. The bright glowing eyes of the moth man could have been those of an owl. With large wing spans in some of them it doesn’t take much to stretch the imagination just a little bit.Good luck trying to tell that to anyone that saw the creature though. I would believe myself over any skeptic had I seen it myself (while running in the opposite direction). With that note on my cowardice I’ll leave everyone to think or go on to where it is they go. This entry was posted in Cryptozooligy and tagged cryptozoology, explained, mothman, paranormal, possibility, unknown, witness. nice article again….are you or have you ever done anything on black eyed kids? Thank you kindly for the compliment. Also black eyed kids? As in them having doll eyes? In what sense are you meaning it since I’m a lil’ lost here. Might have to do a some digging later once I feel better. I’ll give it a read now then. Thanks for the link.